The total annual dollar value of assets seized by federal law enforcement agencies has been soaring since 2011. 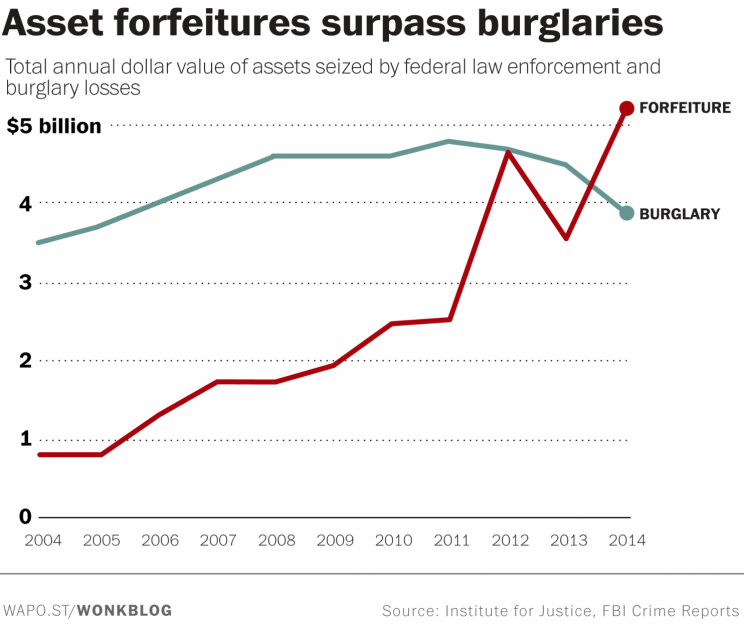 At the same time, however, the total annual dollar value of assets seized through burglary has actually gone down. The American Enterprise Institute (AEI) notes that federal legislators are looking to curb law enforcement’s immense appetite for taking away private property. Wisconsin Republican Congressman Jim Sensenbrenner has presented the Due Process Act. – Enhances procedural protections of forfeiture proceedings in both civil and administrative settings and prevents government overreach. – Increases the government’s burden of proof in civil asset forfeiture cases to help protect innocent victims. – Expands protections to innocent owners by requiring the government to prove the connection between the property and the offense and that the property was used intentionally in order to seize it.